"Kaholas & Co.; Hawaiian Ukulele. Warranted 6-7-8." 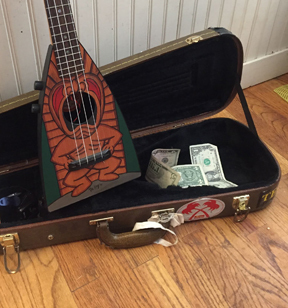 Research suggests that some may have been made in Hawaii, but others may have been made by Gretsch Circa 1920's The "Hawaiian Ukulele" marking can be confusing. There were many Ukuleles made in the teens and twenties which were mainland made, but carried the slogan "Hawaiian Ukulele" or similar wording. This was what prompted the "Tabu" stamp which is seen on many genuinely Hawaiian built instruments of the period.